When no one managed warehouse after normal office hours, it is vulnerable to burglars invaded. CCTV can be used to real-time surveillance and more convenient to search records. Ensure the cargo security and unburned preventive. 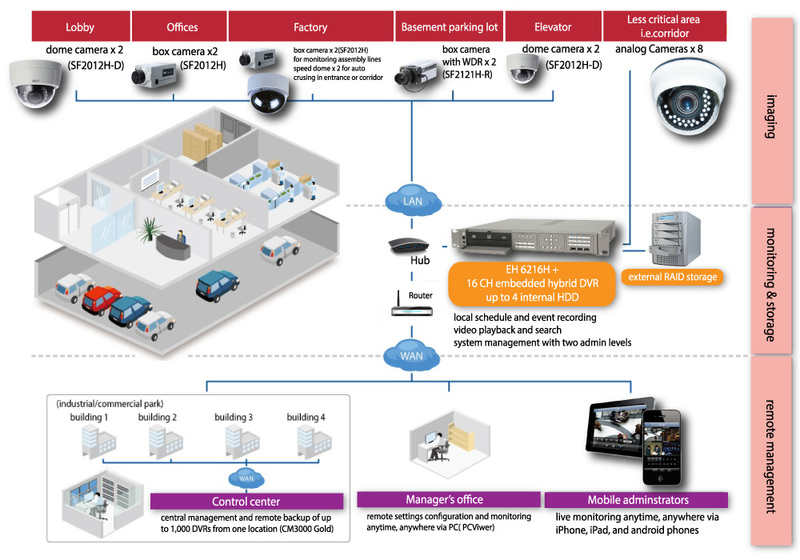 Here we take a commercial and industrial warehouse as an example, overview how the company remote monitor the security and operation of warehouses in different office locations. - Decide the location that need to install CCTV / burglar alarm. In this example is lobby, offices, factory, basement paking lot, elevator and corridor. - Authorized persons such as control centers and department head, the device can view images through the different locations of instant case. - Authorized persons can also view images through mobile devices, such as a licensed mobile phones or laptops.